Tribal treasures: Skinner’s December 2 auction | Skinner Inc.
Hethuska Society Painted Hide, c. 1880s, probably Ponca, depicting drummers, a buffalo hunter, and dancing warriors wearing regalia associated with this particular dance, believed to have been originally performed by the elite warriors of the Ponca tribe (Lot 203, estimate $60,000-80,000). 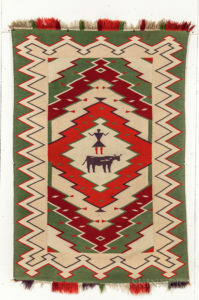 Historic Sioux Muslin Winter Count, c. 1930. The highly detailed painting is a later copy, probably depicting the years 1823-1908. The piece depicts 85 important events. Number 59 probably portrays Hunkpapa chief Sitting Bull and his people, after their surrender in 1871, being taken to their reservation on a steamboat (Lot 202, estimate $15,000-20,000). Figural motifs from diverse cultures abound in the more than 440 lots in this auction. One of the most unusual is an Easter Island Carved Wood Lizard Man, Moai Moko, c. 19th century, semi-human male form with reptilian head (Lot 89, estimate $6,000-8,000). Another striking example is a Songye Community Power Figure, with copper strips on nose and cheeks, cowrie shell eyes, and small power packs in abdomen and top of head (Lot 82, estimate $15,000-20,000). Other figural items include an Olmec Terra-cotta Baby Figure, c. 1000-500 BC, the seated figure holding a vessel in its lap (Lot 26, $5,000-7,000) and a Cherokee or Creek Figurative Steatite Pipe Bowl, c. first half 19th century, depicting a man in a tailcoat and period hat (Lot 244, estimate $1,000-1,500). This auction includes a large assortment of sought-after Northwest coast tribal material. 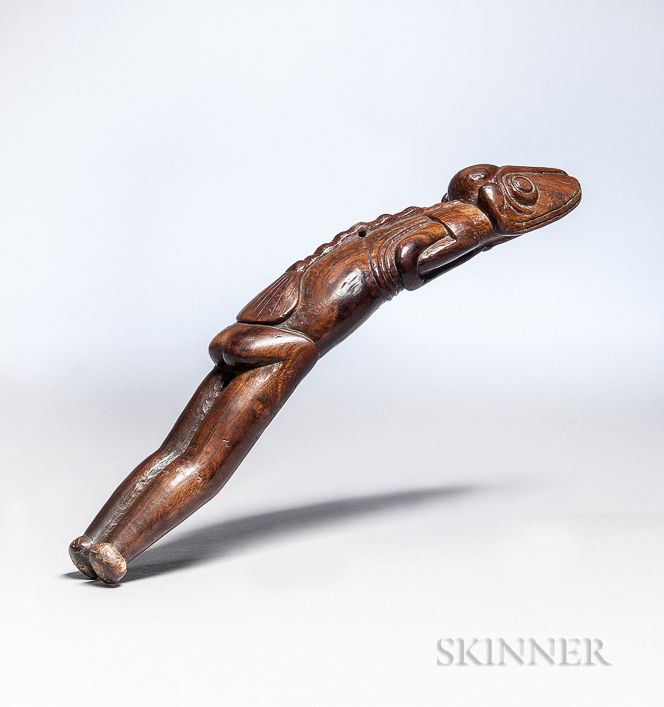 An especially notable example from a large collection begun in the 1970s is a Northwest Coast Carved Wood Halibut Hook, c. last quarter 19th century, depicting a shaman being bitten on the cheek by a small animal (Lot 290, estimate $2,000-2,500). Beadwork is offered in multiple forms, including moccasins, leggings, gauntlets, cradles, pouches and belts. Other beaded objects include a collection of Northeastern beaded bags belonging to Gerry Biron, who wrote a definitive work on the form. The most important beaded piece is a unique Historic Sioux Beaded Buffalo Hide Knife Sheath from the Little Big Horn Battlefield, c. 1870 (Lot 223, estimate $30,000-40,000). It was collected on the battlefield by William O. Taylor, who served with the 7th U.S. Cavalry. Taylor was part of the group of survivors who had the task of burying Custer and his men. Navajo Child’s Blanket, tightly woven in a banded pattern using natural dyes (Lot 391A, estimate $6,000-8,000). Navajo Germantown Weaving, c. 1880s-90s, tightly woven with an overall serrate diamond pattern. Known as Germantown rugs for the Pennsylvania town where the brightly colored yarns originated, a unique feature of Germantown rugs is that the fringe is added after the rug has been woven. Thus, even if the fringe has been damaged, the structure of the textile retains its integrity (Lot 385. estimate $4,000-6,000). African art with over 50 pieces from the collection of Fred Schwartz. Proceeds will benefit the Auschwitz Institute for Peace and Reconciliation, the genocide-prevention organization he founded in 2006. Auction previews are free and open to the public. Print catalogs may be purchased at subscriptions@skinnerinc.com. Prices realized will be available at www.skinnerinc.com during and after the sale. The Skinner website enables users to view all lots in the auction, leave bids, and bid in real time. Bidders participate in person, by phone, and online. Join auctions live with SkinnerLive! and Bidsquare. Skinner auctions draw international buyers and consignors, with material regularly achieving record prices. The company’s auction and appraisal services focus on fine art, jewelry, furniture, and decorative arts from around the globe, as well as wine, fine musical instruments, rare books, Asian art, clocks, Judaica, and more. Skinner Discovery and Irresistible Unreserved auctions feature a breadth of estate material. One of the most trusted names in the business, Skinner appraisers have appeared on the PBS-TV series, Antiques Roadshow, since the show’s inception. Skinner has galleries in Boston and Marlborough, Massachusetts, as well as in New York City and Miami, Florida. Learn more at www.skinnerinc.com and find us on Facebook, Twitter, and Instagram. This entry was posted in News and tagged American Indian Art auctions, Douglas Deihl, ethnographic art auction, Michael R. Evans, tribal art auction by Kerry Shrives. Bookmark the permalink.